Yesterday I wrote a Cardboard Commentary article on changes I would like to see with the retail products that card companies come out with - hopefully you got a chance to read it! In that article I wrote about how I wanted to see more exclusive, retail-only cards. Panini Prizm is a brand that offers some pretty nice retail-only exclusives, so I went for a blister pack of it. I threw in two packs of Upper Deck Series 1 hockey for good measure. I usually go for blaster boxes on Retail Review, but I just couldn't help but get this Prizm blaster when I saw it at the store. I've just really wanted to get nicer, more interesting cards at the retail level, and I thought this was a good place to start. 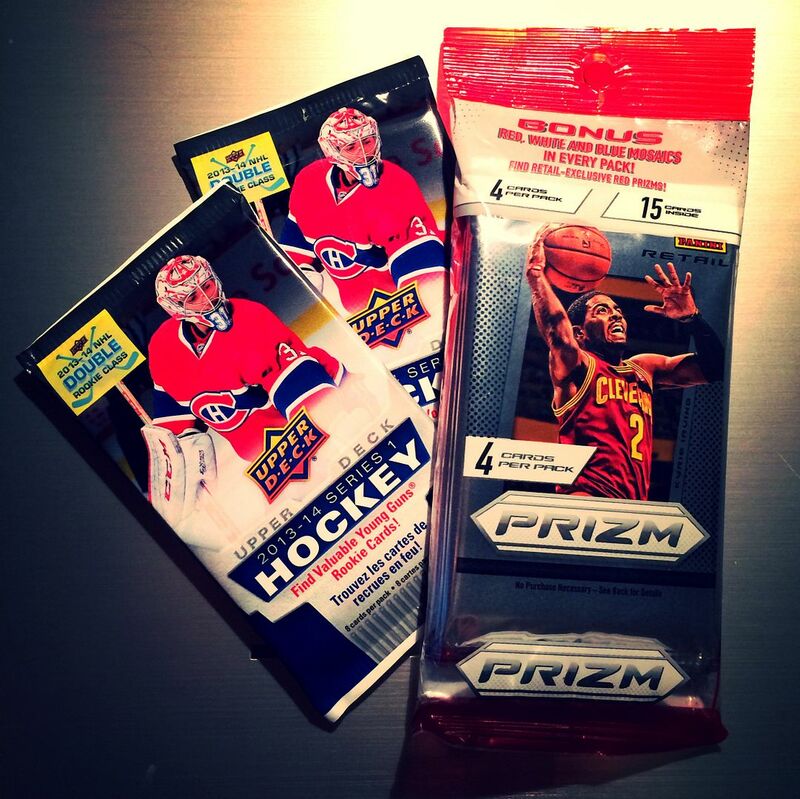 The Prizm package comes with 4 total packs, three regular retail packs and a special bonus three card parallel pack. It's so cool that Panini has given retail buyers something that is exclusive only to these products. That's definitely the direction I would like to see Panini and other companies go towards. I would have really liked to get some retail Prizm hockey, but that's just not going to happen at my local target in Woodland, Ca. It surprises me that we even have hockey at all in our little town. So I ended up picking up a couple of Upper Deck packs to break today. Upper Deck is always a solid product at retail be it in blaster or pack form. I wanted to keep my spending to under $20 so I only chose to get two packs. My Target has giant rack packs of UD1 for sale as well, but I really don't think there is much to look for in them as you pay a little more to just get a bunch more base cards. No thanks! There was no box to open, so that made this break extra quick. As I suspected, the Prizm break was the most fun. The Prizm cards are very nice and premium - especially at retail - and there were some very good looking parallels. Because the Prizm base set is smaller than something like Score, getting star players is easier... and I was able to get some nice basketball stars in the Prizm packs. The three-card bonus pack was actually very sweet. It's great to see Panini being more creative with their parallel cards. Instead of just sticking to one color, they were able to get three in a very USA themed design. The Upper Deck packs didn't disappoint either! Though one back was all base, I was able to pull a Young Gun out out my other one. 1:2 for a YG is beating the odds! Overall I was pretty happy with this little pack break. I still feel like I haven't pulled a great Young Gun this year, but pulling a Young Gun out of two packs is better than no Young Gun at all. 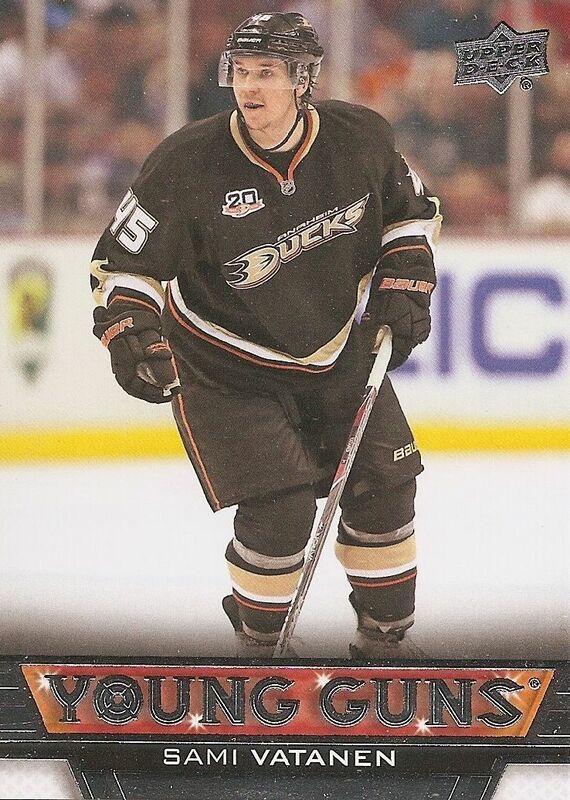 I definitely prefer this to an MVP base card or NHL Heroes card. Green is a color that card collectors seem to love. 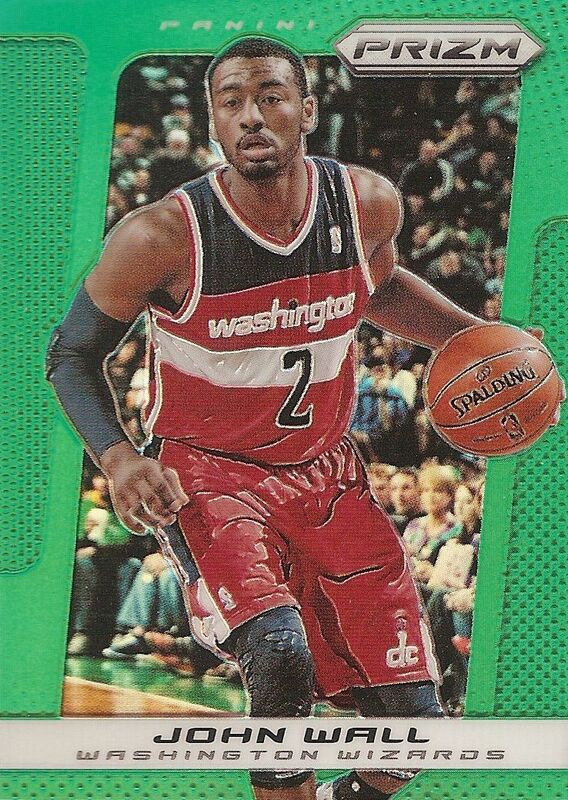 Panini's green parallel cards in hobby are usually numbered to just 5! This card isn't that short-printed, but the card looks beautiful! And getting John Wall isn't too shabby either. I am a huge fan of Panini's efforts with these special retail cards. They are very unique looking and add so much to the retail experience. 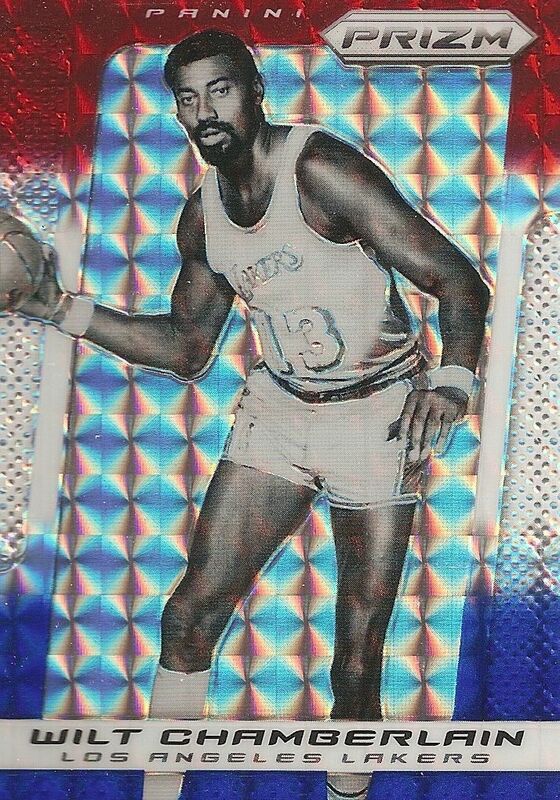 Wilt was my best player in terms of the cards I got from my bonus pack - he's a basketball legend! Wow, I should do these pack breaks more often. I didn't get any card today that I could take to the bank, but I think the overall value of the cards that I received today was solid. The break was quick but enjoyable, and I don't mind repeating it in a future Retail Review. I would definitely recommend getting Prizm blister packs at the retail store if you can find them. They seem a great value to me!